Opposition to trade unions comes from a variety of groups in society and there are many different types of argument on which this opposition is based. The economist Milton Friedman, advocate of laissez-faire capitalism, believed that unionization frequently produces higher wages at the expense of fewer jobs, and that, if some industries are unionized while others are not, wages will decline in non-unionized industries. By raising the price of labor, the wage rate, above the equilibrium price, unemployment rises. This is because it is no longer worthwhile for businesses to employ those laborers whose work is worth less than the minimum wage rate set by the unions. Trade unions often benefit insider workers, those having a secure job and high productivity, at the cost of outsider workers, consumers of the goods or services produced, and the shareholders of the unionized business. The ones who are likely to lose the most from a trade union are those who are unemployed or at the risk of unemployment or who are not able to get the job that they want in a particular field. [page needed] It is argued that over the long term, unions reduce investment in a business, which in turn makes that business less competitive and over the long run will therefor reduce employment in unionized industries. In addition, unions can also cause slower job growth (3 to 4%) for unionized workplaces as opposed to non-unionized workplaces. Unions can also increase jobs losses, with James Sherk arguing that at newly organized workplaces, employment can fall from between 5 to 10%. Sherk notes that some studies find no effect on employment but argues that these tend to focus on workplaces where unionization had little effect of any kind at all, meaning that jobs did not disappear but wages did not rise either, which for Sherk means that these studies cannot be used to argue against unions causing job losses. However, Sherk also argues that there is no evidence that unions increase the risk of bankruptcy for unionized firms, noting that unions try to avoid ruining the companies they organize at and will make concessions to keep distressed firms afloat, generally by agreeing to layoffs for newer workers in order to maintain wages for more senior ones. Advocates of unions claim that the higher wages that unions demand can be paid for through company profits. However, as Milton Friedman pointed out, profits are only very rarely high enough. 80% of national income is wages, and only about 6% is profits after tax, providing very little room for higher wages, even if profits could be totally used up. Moreover, profits are invested leading to an increase in capital: which raises the value of labor, increasing wages. If profits were totally removed, this source of wage increase would be removed. According to The New York Times, wages in 2012 fell to a record low of 43.5 percent of GDP. James Sherk argues that unions generally reduce a businesses' profits by about 10 to 15%, though Sherk notes this is more common in firms that have a competitive advantage (it is hard for unions to reduce profits in a competitive market), as this means these firms have higher than normal profitability, so this redistribution does not risk scaring away investors. However, reducing business profits does reduce the money available for a business to launch new investments. Unions may also hamper recovery from economic recessions and depressions, as they reduce profitability and thus deter the investment required for recovery. James Sherk argues that American states with greater rates of unionization took longer to recover from the 1982 and 1991 recessions, as well as arguing that the unionization that was encouraged under the policies of Franklin D. Roosevelt during the Great Depression actually contributed to reducing the speed of recovery during the period. If unions succeed in wage hikes, and employers raise the prices they charge consumers to maintain their own profit margins, and the supply of money remains the same, then something else has to "give." Either the prices of goods and services in nonunion sectors have to fall and offset the union sector hikes, or people's cash balances need to fall, in terms of their purchasing power. Some trade unions, such as the Teamsters, have been criticized for involvement with organized crime. The argument that unionized workers raise their own wages above their natural rate at the expense of their businesses or other workers assumes that unions never raise productivity to compensate for higher wages. Unions are capable of raising productivity by reducing turnover, by increasing coordination between workers and management, and by increasing workers' motivation. Many unions raise the productivity of their workers, and some even raise it enough to make up for wage increases. Another argument raised by union supporters is that unionized workers will spend their higher wages, driving economic growth and creating new jobs. Union opponents respond that this is an example of the broken window fallacy; union supporters assume that money is more valuable in the hands of unionized workers than in the hands of whoever else would obtain it in the union's absence. There is some evidence that this is not a fallacy, as greater wealth equality seems to be correlated with greater economic growth. Union supporters counter that unions, if organized without violence or government help, are part of the free market; if unions can win higher wages for their workers without coercion, those wages are legitimate. Trade unions take strike actions that result in the disruption of public services – as demonstrated in the British Winter of Discontent. However, where applicable, this may be logically inferred to be the very purpose of strike action per se. In some cases, unions' strike have led to violent clashes with police and with strikebreakers. See the article on the UK miners' strike of the 1980s. The record shows that black workers...have been used to break strikes. This availability has usually ended when the black worker has been shown that the union is open to black as well as white. However, in a study called The Black Worker, Spero and Harris observe that more strikes [in American labor history] have been broken by white workers than by black workers. Most blacks were barred from membership in the AFL not because of their skin color, but because they never had a chance to learn a skill, and "most A.F. of L. unions did not admit unskilled mass-production workers." While the AFL-CIO is the modern version of the AFL, it is much more open to membership by women, immigrants, and different nationalities. Other unions, such as the Industrial Workers of the World and the International Longshore and Warehouse Union, were created without regard to race from the very start. Illegal union firing increased during the Reagan administration and has continued since. Specific countries, especially undemocratic countries, while still having unions in name, do not allow for independent trade unions, just as they rarely allow for independent businesses. These state-run trade unions do not function in the same way as independent trade unions and generally do not hold any kind of collective bargaining power, acting to ensure the smooth running of Government industry. Attempts to reduce the effects of trade unions may include union busting activities by private companies or state action including governments of authoritarian regimes such as in Adolf Hitler's Nazi Germany and Burma's military dictator, Ne Win. Many democratic governments have also attempted to limit the effects of unions, although success has been mixed. It has been argued, particularly by market anarchists, that government intervention in the economy has been decidedly anti-union, even in economies like the United States or the European Union. Kevin Carson maintains that the most effective union tactics are either criminalized or displaced by state policy in most countries. Trade unions established themselves through sitdown strikes, sympathy strikes, secondary boycotts, and hot cargo agreements; these tactics are all illegal in most industrialized countries. Similarly, the original unions doubled as social welfare organization, using union funds to provide healthcare and pensions to workers and welfare to the unemployed. By adopting various welfare-state measures, governments made the populace less dependent on unions. An anarcho-syndicalist flyer exhorting workers to "Give Union Bosses the Flick!" 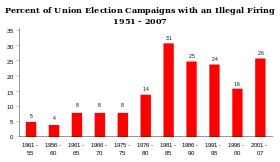 The political left is often associated with support for trade unionism. However, some groups and individuals have taken a less positive view. In the nineteenth century, a belief in the iron law of wages led some socialists to reject trade unionism and strike action as ineffective. In this view, any increase in wages would lead manufacturers to raise prices leaving workers no better off in real terms. Karl Marx wrote a pamphlet, "Wages, Price and Profit", to counter this idea, which had been put forward in the International Workingmen's Association by a follower of Robert Owen. "Trade Unions ... constitute an aristocracy of labour who [are] ... a hindrance to that complete organisation of the proletariat which alone can obtain for the workers their proper control over their own labour ... Being also ... unsectarian and unpolitical, they prevent any organised attempt being made by the workers as a class to form a definite party of their own, apart from existing factions, with a view to dominate the social conditions – a victory which ... can only be gained by resolute political action." Hyndman went on to urge workers to devote "the Trade Union funds wasted on strikes or petty funds" instead to the building up of a strong Socialist Party on the German model. Other social democrats however were more convinced than Hyndman of the utility of Trade Union action. Trade unionism is criticised by those of council communist and left communist tendencies. Here, trade unionism is seen as being more useful to capitalists than to workers, and as a kind of "safety-valve" that helps to keep working-class discontent within reformist channels and prevent it from evolving into revolutionary action. They consider a global state composed of workers' councils to be the ultimate union to which all workers in the world belong; unions that organize based on trade further divide the working class and act as a mechanism to allow the working class to vent concerns without actually uniting and becoming revolutionary. In contrast to other left critiques of trade unionism, these tendencies do not accept that the problems they identify could be remedied by changing the structure, leadership or objectives of trade unions. They argue that trade unionism is inherently reformist because it is sectarian and is not founded in the workplace itself and that revolutionary action is possible only if workers act outside trade unionism through workers' councils or other channels. There is also a philosophical difference between the craft unionism of many AFL-type unions, and the industrial unionism of organizations such as the Industrial Workers of the World. Industrial unionists decry a practice that they call "union scabbing," in which craft unionists are required by the no-strike clause in their contracts to cross the picket lines of other unions. There is also the left critique of the tendencies of some labor unions to become bureaucratic and for the union leaders and staff to become detached from the needs and interests of the rank and file union members, in contrast to the practices of union democracy. The Labor Notes, in the United States, is an example of an organization that attempts to fight this bureaucratic tendency. Joseph Stiglitz (2002). Employment, social justice and societal well-being International Labour Review, 141 (1–2), p. 9 – 29. ^ Robert P. Murphy. "Can Unions Cause Price Inflation?". Mises Institute. Retrieved 18 October 2011. ^ Fitch, Robert (2006). Solidarity for Sale: How Corruption Destroyed the Labor Movement and Undermined American Promise. PublicAffairs. pp. 134–55. ^ "Unions Are Good for Business, Productivity and the Economy". Aflcio.org. Archived from the original on 11 December 2011. Retrieved 18 October 2011. ^ "Union productivity effects | Monthly Labor Review". Find Articles. 1985. Archived from the original on 7 January 2012. Retrieved 18 October 2011. ^ "Critique of SC's ruling on the right to strike, from Volume 2, Issue 6, of Combat Law". Indiatogether.org. Retrieved 18 October 2011. ^ Colin Hay (2010). "Chronicles of a Death Foretold: the Winter of Discontent and Construction of the Crisis of British Keynesianism". Parliamentary Affairs. 63 (3): 446–70. doi:10.1093/pa/gsp056. ^ "Furlough negotiations: $50M ransom offered, but unions balk at releasing hostages". Hawaii Free Press. Retrieved 18 October 2011. ^ "Unions will hold us all to ransom". Irish Independent. 14 July 2009. ^ a b A Pictorial History of American Labor, William Cahn, 1972, p. 160. ^ A Pictorial History of American Labor, William Cahn, 1972, p. 231. ^ Solidarity Forever – An oral history of the IWW, Stewart Bird, Dan Georgakas, Deborah Shaffer, 1985, p. 140. ^ "American Experience | The Fight | Nazis in the News". PBS. Retrieved 18 October 2011. ^ "E: The Third Reich". Colby.edu. Retrieved 18 October 2011. ^ "The Creation Of A Fascist Dictatorship / Totalitarian State In Germany". Pmaci.customer.netspace.net.au. 27 February 1933. Archived from the original on 4 October 2011. Retrieved 18 October 2011. ^ Roughneck: The Life and Times of Big Bill Haywood. Peter Carlson, 1983, p. 80.